Invited by Polskie Radio, general directors of the biggest European PSM, representatives of the EBU, WorldDAB and the car industry gathered on 6 October in Krakow for the European Radio Forum to discuss the issues of DAB+, hybrid radio and European digitalization strategies. The conference was a place of a vibrant discussion. Poland’s Prime Minister Beata Szydło addressed a letter to the participants of the European Radio Forum stressing the importance of the question of radio digitalization. The conference was opened by Dr. Barbara Stanisławczyk-Żyła, President of the Board and Editor-in-Chief of Polskie Radio. She pointed out the key problems that Polskie Radio faces: lack of national digitalization strategy, reluctance of commercial broadcasters and high costs of simulcasting. The President of the Board of Polskie Radio stated that she has no intention to withdraw hastily from the digitalization process and to destroy what has been already achieved. – We meet today to look together for the best solution and if we can find a compromise or agreement, I would be happy – said Dr. Barbara Stanisławczyk-Żyła. – We also need support from the car industry. Majority of listeners tune in their radios in cars. Why the car producers in Poland are not eager to install DAB+ receivers? – she asked. Helen Boaden, Radio Director of BBC, pointed out that in the United Kingdom there is an agreement among PSM, private radios and the government concerning DAB+ broadcasting. The process lasts already for 20 years and nowadays 45% of listeners use digital radio and 85% of cars have DAB+ receivers. Among the most important challenges faced by radio broadcasting in the UK Helen Boaden pointed out the development of hybrid radio, dedicated especially for mobile phones. - The key issue, that we are now working on in our country, is to improve the signal quality while reducing data collection and thus the costs of the use of mobile phones - said Helen Boaden. The situation in Germany was presented by Dr. Willi Steul, Director General of Deutschlandradio. 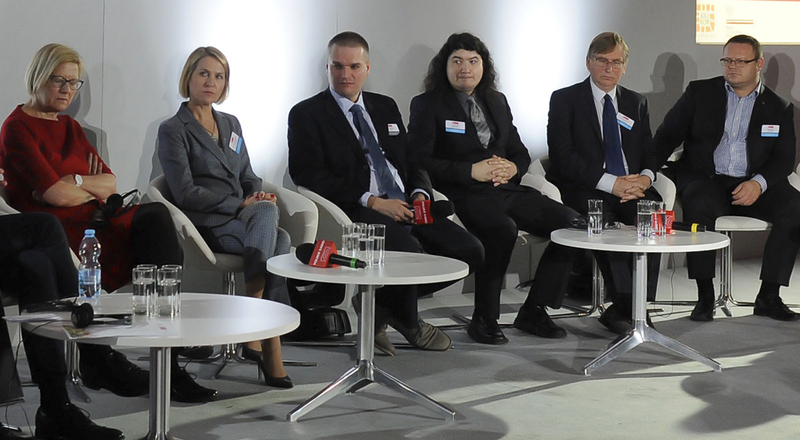 He expressed his belief that the future belongs to hybrid radio and stressed that the key issues mentioned by the Dr. Barbara Stanisławczyk-Żyła in the context of Poland, are the same across Europe - with the exception of countries that are very advanced in the implementation of DAB + - Switzerland, Norway, Great Britain. - What can we do to tackle these problems? Ask for the support of politicians, ask car industry to install DAB+ receivers, and above all, to build a coalition based on the belief that digital radio is needed - said Dr. Willi Steul. - I am convinced that in the end we will turn off Deutschlandradio FM and switch to digital broadcasting only. Radio will survive, radio will be digital radio, it will be hybrid! - stressed Dr. Willi Steul. Radio digitization in Hungary is a vague future, and the key to success is the content of the program - said Miklós Vaszily - Director General of the Hungarian public television and radio MTVA. In Hungary, practically nobody discusses digitization, people know nothing about DAB +. The government launched a tender for digital frequencies, but it was won by a radio station, which did not broadcast anything and blocked the frequencies for several years. But Internet radio is growing. It is very popular among young people and among those, who are active in social media. - Poland is an excellent example for the Hungarians. We will look carefully to your process of digitization and we are eager to copy the best solutions - said Miklós Vaszily. Two countries would like to use DAB+ technology to enlarge its audience numbers, because digital radio offers more programs on one frequency. Moldova was represented by Veaceslav Gheorghiscenco, Radio Director of Teleradio Moldova. He said that Moldova presently looks at what is happening in Europe with the digitization of radio. The Vatican is experimenting with different digital technologies and wants to use DAB + to allow the reception of its program in Italy, informed Paolo Lazzarini, Technical Director of Radio Vaticana. Rene Wehrlin, digitization specialist at BAKOM, the Swiss regulator for radio and television, presented data on digital radio in Switzerland, where DAB + has been present for 7 years. There is broad agreement among PSM, commercial radio stations, the regulator and the automotive industry. Switzerland has implemented a strategy that subsidizes by 2020 up to 80% of the costs of the transfer of radio transmissions to DAB +. Over the next four years, by 2024, this support will be withdrawn. In Switzerland people generally believe that if the radio would remain analogue, listeners will lose interest and that is why the broadcasters eagerly introduce DAB+ technology. Switzerland also decided that all road tunnels longer than 300m will be equipped with DAB+ transmitters. Rene Zavoral, Director General of Czech Radio said that in the Czech Republic FM is still the main platform for radio and will remain so in the near future, despite the fact that Czech Radio has been broadcasting in DAB+ for 10 years. - The development of DAB+ is one of the priorities of our radio. We also see great potential in hybrid radio. In my opinion, it is the future of radio, especially considering the young people and their habits related to the use of the Internet - said Rene Zavoral. He stressed that for the Czechs is very important to debate at European level. In the Czech Republic any discussions about a national strategy for the digitalization of radio broadcasting has been postponed till 2021. Representing the automotive industry, Dr. Michal Simunek, DAB+ radio provider for Skoda, said that the number of cars equipped with DAB+ receivers keeps growing. The company also began work on developing a hybrid radio that can be installed in cars. Such radios will be able to receive both analog (FM) and digital (DAB +) and a radio line (the Internet). President of WorldDAB, Patrick Hannon, said that the key to success in the development of the DAB+ platform in Europe is determined by political vision and collaboration with industry. He argued that at the European level we need regulations that would encourage commercial broadcasters to move to DAB+, and manufacturers of audio equipment to produce receivers capable of receiving both FM and DAB+. On the other hand, Graham Dixon, Head of Radio at the EBU (European Broadcasting Union), in opposition to the previous speakers, pointed to the weakness of Internet radio and strongly argued that the future of radio is DAB+. The Forum concluded with an open debate of all panel participants and the gathered audience. Graham Ellis, Deputy Radio Director at BBC took note of the considerable differences in experiences presented by speakers from Poland, the Czech Republic and Hungary and those representing the UK, Germany or Switzerland. He stressed the imperative need for actions at national level, as well as for strategies, regulations and cooperation between public and commercial broadcasters with the government. Without such joint efforts and national agreement there is little chance for developing DAB+. Answering questions from the public whether the advancement of ever new digital broadcasting technologies could make DAB+ obsolete, the panelists were unanimous in opinion that relevant decisions should be taken as quickly as possible. Postponing them by ten years will bring us to face the same dilemma after that ten year period, they argued. Dr. Barbara Stanisławczyk-Żyła, President of the Board of Polskie Radio, said the purpose of inviting colleagues from across Europe had been to discuss the best possible solutions for developing public radio, which is responsible for the management of public money and cannot risk squandering the funds. She reiterated the will not to withdraw from the digitization process , however, there must be assurance that Polish Radio shall pursue development in a rational manner. - I agree with Willi Steul that the promotion of DAB+ should commence no sooner than at the stage when there is close to 100 percent of national territory covered by the digital signal. But I also stress the importance of discussing the matter earlier. Especially in Poland, where knowledge of DAB+ is particularly low. I am confident that our meeting will initial such a debate which, in turn, shall contribute to raising social awareness of digital radio - said Barbara Stanisławczyk-Żyła. Summing up the conference and its discussions, Helen Boaden observed that one conclusion is certain – the financial situation of a country and that of the broadcaster, as well as political commitment are the key factors affecting the development of digital radio. Thanking all the participants, Dr. Barbara Stanisławczyk-Żyła voiced deep conviction that the Forum has been the first step in discussing the future of radio in Europe and preparing society for the introduction new digital technology.